Looking for an awesome potato recipe? 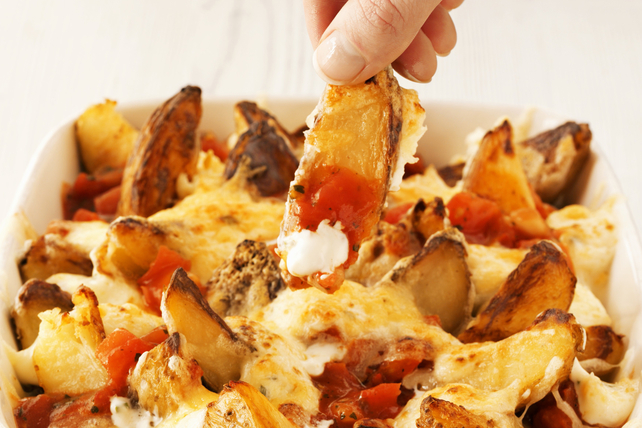 Then, try our recipe for Tex-Mex Cheesy Potato Wedges. It's a twist on poutine and nachos - two favourites in one easy-to-make recipe. Enjoy! Cut potatoes into 1/2-inch-thick lengthwise wedges; place in large bowl. Add oil; mix lightly. Bake 35 min. or until potatoes are tender and golden brown, turning after 20 min. Meanwhile, mix chili sauce, Worcestershire sauce and garlic powder until blended. Spoon potatoes into shallow ovenproof dish sprayed with cooking spray. Top with chili sauce mixture and cheese; bake 3 min. or until cheese is melted. Substitute 1/4 lb. (115 g) Cracker Barrel Mozzarella Cheese, cut into 1/4-inch cubes, for shredded cheese. Serve topped with light sour cream and sliced green onions.